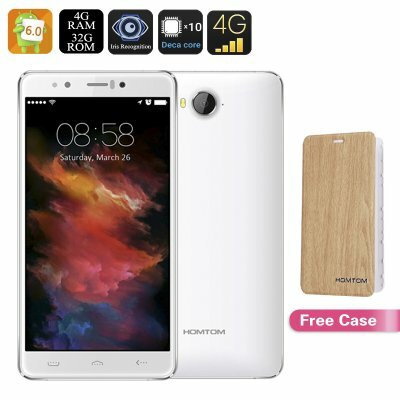 Successfully Added HOMTOM HT10 Android Smartphone - 21MP Camera, Iris Recognition, 4G Dual-SIM, T720 GPU, Deca-Core CPU, 4GB RAM (White) to your Shopping Cart. The HOMTOM HT10 is one of the latest Android phones that packs a number of amazing features. Running all the latest Apps, games, and FHD movies in astonishing speeds, snapping mind-blowing 21MP pictures, and offering state of the art Smartphone security through Iris Recognition technology – the HOMTOM HT10 has it all and is available at an exceptional price. With its epic Deca-core CPU running at 2.3GHz, Mali-T720 GPU, and 4GB or RAM the HOMTOM HT10 is a real power horse that can handle the latest apps, Games, and all your HD media files without breaking a sweat. Along with Google Play installed on your cell phone you literally have access to millions of Apps, movies, and games that can all be enjoyed into their fullest detail on the HOMTOM HT10’s 5.5 Inch FHD display. Take your Smartphone multimedia experiences to the next level – this state-of-the-art Smartphone along with its 3200mAh removable battery that offers a continuous usage time up to 8 hours, is the ultimate entertainment device for you to enjoy all your favorite multimedia files in stunning quality. Featuring second generation Iris Recognition Technology the HOMTOM HT10 has been equipped with the latest and finest Smartphone security available. Simply unlock your Smartphone in less than a second by just looking at the device – with this HT10 it’s possible! Unlocking your cell phone has never been easier while all your personal files have never been more secure, by using this Iris Recognition feature you literally take a peek into the upcoming future of Smartphone security. Equipped with a mesmerizing 21 MP rear camera the HOMTOM HT10 allows you to snap pictures and record footage of mind blowing quality straight from your phone - rarely experienced before by the majority Smartphone users. Whether you use your camera to record your unforgettable memories with your friends during a night out or are on holiday and want to take the perfect landscape picture, this 21MP camera allows you to capture and share all your amazing memories with your friends and loved ones in a never before experienced manner. Having the possibility to insert two 4G connectivity SIM cards simultaneously this Smartphone allows you to always stay fully connected by using the fastest date transmission speeds up to date, no matter where your life is taking you. Separating work and private life on one device has never been easier with its two IMEI numbers. By using the HOMTOM HT10 you’ll always be in reach of your colleagues, friends, and loved ones.